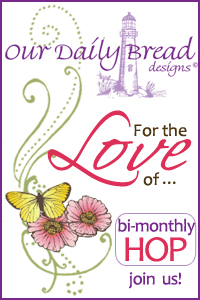 Welcome to the Our Daily Bread Designs Alumni Team bi-monthly hop, this weeks hop theme is For the Love of Love Friendship! If you arrived here from Tosh's Blog you are in the right place, a complete list of those participating in the hop can be found the ODBD Blog. You'll want to be sure to visit and comment on all the participating designers blogs, because one of them is a hop hot spot and a name will be drawn from that blogs comments to win a $15 ODBD gift certificate towards stamps. You have until Wednesday, February 13th at 6PM EST to leave comments. Inspired by this weeks theme and the Mojo Monday Sketch, I used Our Daily Bread Designs Faithful Friend set and pattern paper from My Minds Eye Ruby Collection to create my card. The quote is stamped in Black on a scrap piece of pattern paper. I created the Fish Tale die shape using the Silhouette, cutting the base layer from Black, then made and internal offset and cut that panel from scraps of the My Minds Eye paper. The dragonfly was stamped in Black on scrap paper, cut out and popped up on dimensionals over the image I stamped on the square panel. To embellish I added Zva Creative Crystals (CRS-04CB-109) and Mini Roses along with some Crochet Trim. Your next stop on the hop is Silke's Blog! This is so gorgeous, Lisa!! I love the layout and colors you used....yummy!!!! Oh how pretty Lisa! I love the sketch you used and the colors are among my faves! Great way to showcase these stamps!!! Great take on the sketch! Love your DPs and the colors you used. Very Pretty! The sentiment is powerful and the card is pretty. What a fun and beautiful layout Lisa!! Love the added banners!! That is one of my fave friendship sentiments! Lisa, such a great card; who wouldn't want to recieve this. Great sentiment, speaks so much. So PRETTY, Lisa! 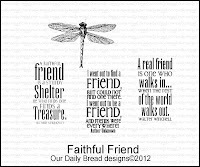 LOVE that saying and your dragonfly! Great design and use of color. I like the sentiment so very much! I especially love the sentiment you chose. And your black flourish looks like the path the dragonfly took. Nice touch! I didn't care for the mojo monday sketch this week but your card shows how nice it really is. The flowers and dragonfly perfectly offset the stark geometric design. Nicely done. What a true sentiment! Lisa, just love all the layers of pretty papers and that dragonfly! Beautiful! Gorgeous! I love all the black matting you did - makes all the layers really pop. Great card! Gorgeous! I love your sketch! Super cool Lisa!! LOVE the layout and fabulous color combo!! Fresh and fabulous Lisa! I really love the little banners peeking out from the bottom of the image panel. A beautiful card here, Lisa. The colors are subtle and your design is just stunning. Thanks for sharing this with us. This is gorgious and Ill have to try this. I love the layout on this card. Gorgeous Layout love the layering and the colors. love the new stamps thanks for sharing. Lisa, your card is very beautiful. I like he dragonfly...it popped the card. God bless yo! I love the color combination on this. Beautifully done! What a very pretty & elegant card! Thanks for sharing your talents! Nice pink and grey color combo...like the layout too! Pretty design. I like the pink and cream flowers. I love this color combination and the layout you used. Another dragonfly - I think spring is on our hearts if not in our winter wonderland! The dimensional design along with the colors work for young and old alike. Thanks! so pretty and neat layout too, Lisa!! This is a really nice card! I love the colors and the way you've layered them. They accent perfectly! What a beautiful creation, and a wonderful sentiment. Seems so true, doesn't it? Love the dragonfly and your little 'admit one' ticket. Just perfect :)! You have created a wonderful place for this special sentiment. Love the layering and the layout of your card! Beautiful! Love the color combination. The dragonfly is gorgeous and the use of the sketch perfect. Wow! This is perfect in every way. I just love the black contrast as it makes the card stand out. Love the sketch!!! Very pretty card!!! And a hand cut dragonfly? WOW!! Beautiful card Lisa...I love pink and grey together, and such an awesome mount of friendship displayed here!! Another gorgeous card. I really love the sentiment. very pertty, love how you combined the quote and the image together!! Lovely card. Great sentiment and oh so true. Hey Lisa! This is such a great card and one of my fave ODBD stamps!!! Love this! Very pretty--I like the layout. Awesome card!! I love this sentiment! Thanks for sharing. I luv this, sweet banners and I luv this stamp set...have a great week! Great colors and details, Lisa! Wonderful card! So pretty, love the senti and dragonfly,TFS!